YOU PICK THE COLORS AND THE SIZE! This is an easy to put on and off Wagon Harness for Goats. It has four quick release buckles, once set up to the goats size with easy adjusting, takes about 20 seconds to put on or take off the goat. 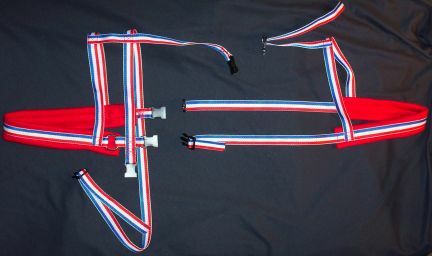 We show photos of this type harness buckled and unbuckled to demonstrate how easy this harness is to use. 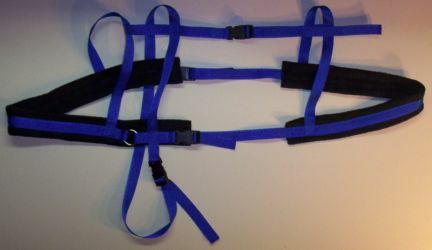 I designed and use this same type harness for my own goats. The photo with the goat wearing the harness is not the harness you will be receiving. It is of my goat to show how nice this harness looks. The Goat Wagon Harness you will receive will not been worn or tried on or been around any other animals. It will be handcrafted in our non smoking, NW SD - USA home with the measurements you send for your goat. You measure your goat, as in the photo, chose the webbing color you would like to have, chose your padding/fleece color. Your order will be sent out within two weeks of paying for your order. All sales are final. No returns unless of course there is a manufacturing error. The photos show this harness buckled and unbuckled, you can see how easy this harness will be to use. To measure you goat, measure from the goat's breast bone, back around to and past the tail (as the main area of the harness would be on the goat) and back up to the other side of the goat.....measure all the way around the goat for correct size. 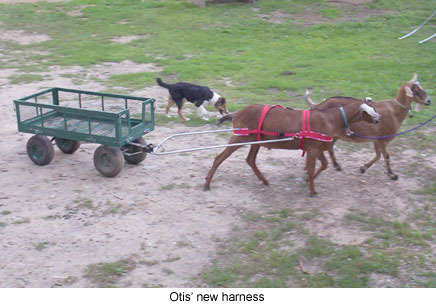 You will also receive information of how we trained our goats to pull wagons as well as easy instructions of how we made our shafts for wagons, cheap and easy to do. Our Animal Items are not refundable or returnable. If there is an error in craftsmanship I am more then happy to fix, repair or replace the items. We have had far too many people want to buy our items, take photos then get their money back on a used item.....I don't think so!! WHEN YOU BUY FROM MARNA'S MENAGERIE YOU ONLY PAY SHIPPING ON ONE ITEM. NOT MATTER HOW MANY ITEMS YOU BUY, YOU ONLY PAY SHIPPING ON ONE (the heaviest item of course). CUSTOM ORDER CAN, BUT USUALLY DO NOT, TAKE UP TO TWO WEEKS TO COMPLETE. THANKS FOR YOUR PATIENCE.